The funny thing about Tortola... we've never had a bad meal. Tortolans know how to cook and their style is influenced by so many different cultures. During our last stay in Tortola, we dined twice at Sebastians on the Beach, in Apple Bay. For about $30, we enjoyed an awesome Mahi Mahi in a indian spice with potatoes. It was fantastic and was served with an awesome view of the sunset over Jost Van Dyke. Dinner starts at 6:30 here, call ahead for reservations so you can be sure to get a table with a view. Brandywine Bay Restaurant (284/495-2301), a South Shore spot some call the best on the island. The romantic spot on a cobblestone terrace overlooking the Sir Francis Drake Channel is run by a husband and wife team well-known for their Florentine menu that changes daily and features only fresh produce. Sugar Mill (284/495-4355), in Apple Bay, is housed inside a 300-year-old sugar mill which makes for a unique setting for such fine Caribbean fare as their famous Curried Banana Soup (recipe published in Bon Appetite). Dinner at Round Hill (284/495-9353), is a five-course meal compliments of Jocelyn and Allan Rhymer in their villa overlooking the Cane Garden Bay beach. Reservations are necessary for the few tables in their home where they serve up some of the best food on the island with what is unquestionably the best hospitality. Capriccio di Mare (284/494-5369), is a local hit for offering the freshest pasta and best pizza in this small Italian cafe. Sky World (284/494-3567), one of the best restaurants on the island, sits high on a 1337 foot peak and delivers spectacular views of the U.S. Virgin Islands and the British Virgin Islands. The restaurant has two sections, one more formal and requiring long pants and collared shirts, the other more casual. The same great menu applies to both sections. The fresh Pumpkin Soup is a favorite. The Jolly Ranger (284/495-4559), an open-air bar and restaurant, serves up stewed conch and burgers and great pizza to mostly locals. Call ahead to see about live music and entertainment. Nightlife: Because Tortola is the biggest of the BVIs, nightlife abounds. Road Town has plenty of reggae-themed bars and Cane Garden Bay has its beach bars. Bomba's Surfside Shack, Apple Bay (284/495-4148), is the oldest hangout on the island, sitting on the beach near the West End. Despite its appearance, the shack puts on quite a party. Every month Bomba's stages a full-moon party, with free house tea spiked with hallucinogenic mushrooms. (The tea is free because it's illegal to sell it.) The place is also wild on Wednesday and Sunday nights, when there's live music and an $8 all-you-can-eat barbecue. Open daily from 10am to midnight (or later, depending on business). The bar at The Moorings/Mariner Inn, Wickhams Cay II (284/494-2332), is usually busy with the yacht owners from the nearby marina. Another popular choice is the Spyglass Bar, in the Treasure Isle Hotel, Road Town (284/494-2501), where a sunken bar on a terrace overlooks the pool and far away marina facilities. The Bat Cave, Waterfront Drive, Road Town (284/494-4880), is on the ground floor of Spaghetti Junction. You'll hear current pop hits playing nightly. The Jolly Roger, West End (284/495-4559), offers local or sometimes American bands, playing everything from reggae to blues. 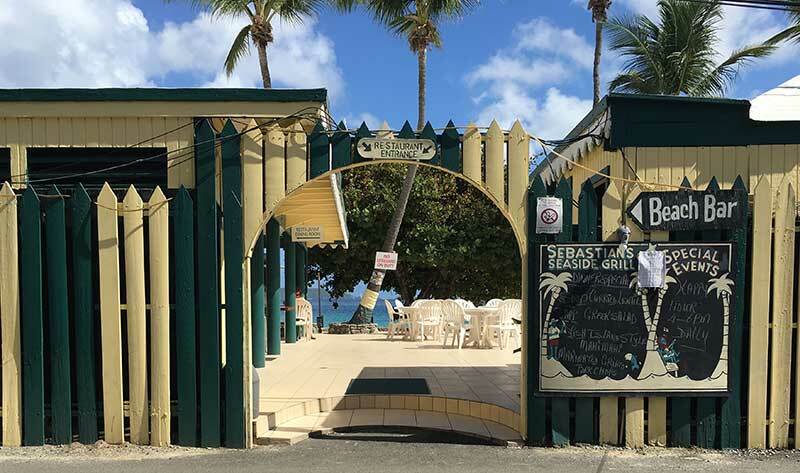 In the same area, visit Stanley's Welcome Bar, Cane Garden Bay (284/495-9424), where a crazy crowd gathers. Sebastian's Seaside Grill, Apple Bay (284/495-4212), features live music as well. Rhymer's, at Cane Garden Bay (284/495-4639), serves up tropical drinks and ribs with occasional steel drum bands playing into the night. Tower Night Club, West End (284/494-1667), is big Friday through Sunday nights for those looking to dance to a DJ.